The Iowa House has embraced a plan that would automatically give felons who’ve completed their sentences the right to vote in Iowa. 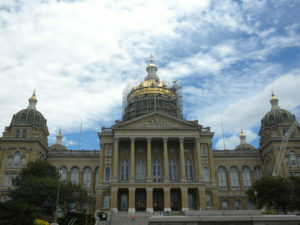 “Because our governor set this forth, it gave us maybe a little extra wind in our sails to get this done,” Hagenow said. Republican Representative Bobby Kaufmann of Wilton indicated legislators will decide later how much restitution and fines must be paid before a felon gets to vote and whether some felons may never qualify to vote again. “I do not believe that rapists, child molesters or murderers should ever have those rights back,” Kaufmann said. Iowa and Kentucky are currently the only states in the country that force felons to apply to the governor to get their voting rights back. House Minority Leader Todd Prichard of Charles City said Democrats are enthusiastic supporters of getting rid of that system and instead give felons their voting rights back when they’re paroled. “If you believe in the concept of redemption and that people can change and that they can come back into and be a functioning and contributing member of society, this is that bill that allows, in a large way, that chance,” Prichard said. Key GOP senators like Brad Zaun of Urbandale have said they’re reluctant to automatically give any felon the right to vote after they’ve been released from parole. “The bottom line here is that it’s going to be an uphill climb,” Zaun said.